It’s that time again where we set our goals for annual dividend income. Just a few weeks ago we reported our all time high for dividend income in one month. We earned over $1,500 in dividend income in December 2018 … making it our highest monthly total. Then we turned around and reported record annual dividend income for 2018. Our dividend income totals for 2018 came in at over $7,000! I can remember back to just a decade ago where we made $29.46 in 2008. So now that we have 2018 behind us … and those dollars earned working hard for us … it is time now to look forward to 2019. 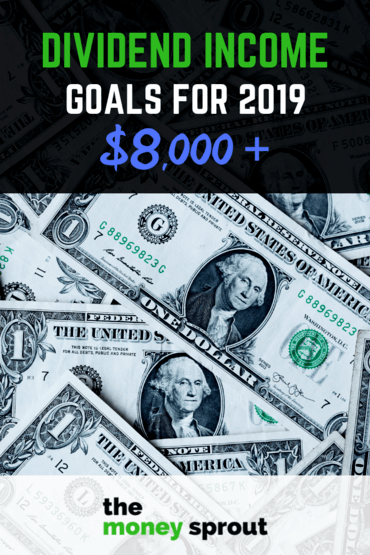 What’s Our 2019 Dividend Income Goals? Every year we try and set goals for building our dividend income stream. Each time that we do, we try and get a little bit better … or in this case we try and earn a little bit more in dividend income. Last year we saw awesome growth in our income stream and we expect the same for 2019. 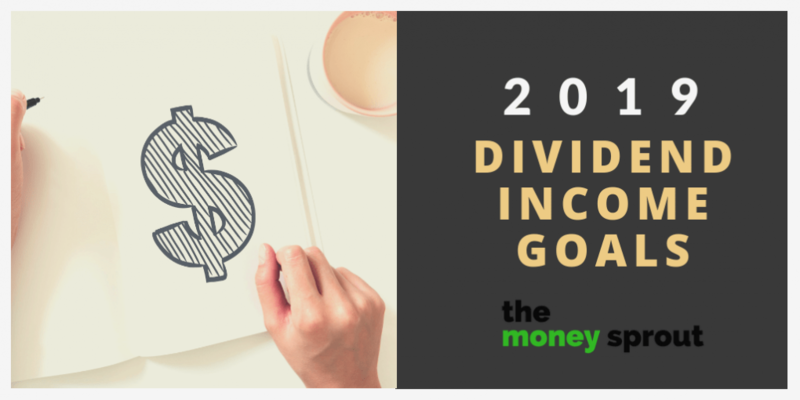 Below you will find a breakdown of our dividend income goals for the upcoming year. We break down our dividend stream in two different sections. The first is our taxable dividends that will be reported as income on our tax returns. We have been building this source of income since 2008. The second part is from our retirement accounts. This income is not taxable in the current year, but could be later down the road in life. We consider both pieces to be critical to our success in reaching financial independence. Let’s start by looking at our taxable dividend income goals. In 2019, we would like to increase our annual dividend income to $3,650 in our taxable accounts. That would be a 17.2% increase compared to 2018. Based on percentage increase, that is similar to the growth we experienced in 2018 (17.5%). Just like in years past, we must continue to make investing in the best blue chip stocks a priority, while reinvesting all our dividends throughout the year and receive company dividend increases. Here is a look at our past dividend income results (2011 – 2018), along with our projected annualized dividend income for 2019. After a record dividend income year in 2018, we want to continue our solid growth trend. In order to reach this goal, we will need to increase our our dividend income by ~$535. Based on our dividend growth strategy, I think this is a reachable goal. How Do We Increase Our Taxable Dividend Income by Over $500? In order to give ourselves a shot at hitting our goal, we need to have a plan in place to bump our dividend income by more than $500. We will start with the easiest path first … which is from company dividend increases. Based on a weighted average, our dividend income grows on it’s own by around 6.19% per year … from company dividend increases. This makes a lot of sense based on our stock screen criteria of purchasing stocks that have a 10 year dividend growth rate of 6% or higher. Based on this data, we expect to earn an additional $185 in 2019 from expected company dividend increases. For simplicity, we rounded down to $185 of additional income in 2019. Next, we can count on another 3% of additional dividend income based on reinvestment. Since we are in accumulation mode of our dividend income portfolio … we reinvest every single penny. On average, we have calculated new investments are earning a 3.13% yield on new shares. Taking a conservative estimate of 3%, we will earn an additional $95 of income from reinvested dividends. We are rounding up a bit to $95 to get a clean number. The final tool we have for increasing our dividend income this year is from new investments. We have a 2019 goal to invest an additional $10,000 of new money in dividend stocks. Using our 3% yield average for new stocks, we are going to estimate another $250 of dividend income in 2019. Why have we only estimated $250 and not $300? Since $10,000 * 3% should be $300. All of our new investments won’t come at the beginning of the year. So we could miss a few quarterly dividend payments at the start of the year. Based on this, we dropped our estimate to $250. Based on all these factors, we can expect our dividend income in 2019 from taxable accounts to grow to $3,650. Note – we rounded up by an additional $5 from our estimate for a nice round number ($3,645 was the actual estimate). Back in 2017, we decided to roll multiple retirement accounts from past employers into a new IRA. In total, we rolled about $145,000 into this account and have been building our portfolio from there. So our first year of tracking the dividend income from these tax deferred accounts was in 2018. Here is a look at our past dividend income results (2018), along with our projected annualized dividend income for 2019. Our goal for 2019 is to earn $4,360 in dividend income. After a much better than expected year for earning dividend income in our retirement accounts, we are excited to see the growth in 2019. In order to reach our new goal, we will have to earn an additional $360~ of dividend income in these accounts this year. The cool thing about this growth is most of it will come all on it’s own … with no new investments … since these are retirement accounts. How Do We Increase Our Dividend Income in Retirement Accounts by Over $360? Just like with our taxable dividend income … we expect our dividends from retirement accounts to grow as well. The only difference is we won’t be investing as many new dollars into these accounts … so the overall increase won’t be as high. Once again, we will start with the easiest path first … which is from company dividend increases. Based on the same weighted (conservative) average of 6% … we would expect to earn an additional $240 in dividend income from company increases. Note – We rounded our 2018 dividend income up to $4,000 as a starting point for 2019 projections. Next, we can count on another 3% of additional dividend income based on reinvestment. Since this income is all in untouchable retirement accounts right now … there is no reason not to reinvest. Using a 3% yield for new stocks, we can expect an additional $120 of dividend income in 2019 from stock reinvestment’s. Since there are no current plans to contribute a bunch of money to our retirement accounts this year, we won’t assume any increase from new investments. Based on all these factors, we can expect our dividend income in 2019 from retirement accounts to grow to $4,360. Between our 2 different accounts, we have conservatively estimated earning $8,010 next year in dividend income. About 55% of that will be building in our retirement accounts … while the other 45% will be in taxable accounts. Here is a look at our past total dividend income results (2018), along with our projected annualized dividend income for 2019. Our goal for 2019 is to earn $8,010 in total dividend income. We already covered in each section above how we plan to hit these goals. And I want to state again that I like to estimate on the conservative side. Earning $8,000+ this year in dividend income is not an easy goal, but it is certainly attainable and realistic. For the past year I have been keeping track of the rule of 72 calculation when it comes to earning dividend income. For more information on this calculation, check out our article – How to Double Your Income Every 9 Years. Basically, this calculation is a way to tell how many years it will take for an investment or in this case your dividend income to double. To figure out the number of years, you simply divide 72 by the annual rate of return. Conservatively, we know that if we left our portfolio alone and simply reinvested our dividends we would earn at least a 2% yield on those dollars. We also can predict an average 6% growth of dividend income from company increases. Combined we use an 8% annual increase average to project future dividend income. Personally … I think this is a bit too conservative but it works well for these projections. Those are some pretty cool numbers when you look at them that way and shows the power of compounding your income and earnings. But I hope to do a lot better than that honestly. The numbers above would assume no new investments would be made to our portfolio in 2020 or beyond. I would like to be able to cut that time frame down even more … which I think is possible. What if we could continue to invest and grow our dividend income by 12% per year? Well … that would mean our dividend income would double every 6 years now (72 / 12) instead of 9 years. By continuing to invest … we could be earning $64,000 annually (enough to cover 100% of our current expenses) in much less time. Based on our 2018 dividend income results and growth, I am looking forward to what 2019 has to offer. Pushing our dividend income over $8,000 in 2019 will help us take one step closer to reaching Financial Independence (FI). Dividend income isn’t are only path to FI … but rather an important part of our overall strategy. We hope to one day cover at least 50% of our expenses from dividend income. And from our calculations … that could be a reality in less than 20 years.